Wood is sturdy but not harsh, lasts for years or even decades, and is one of the most versatile materials out of which a kitchen utensil can be crafted. While all of these facts already tip the scale in favor of wooden spoons, there is also an emotional and visceral reason to use them that comes from the comforting, familiar way wood feels in your hand—not cold and severe like stainless steel, or dull and characterless like plastic. Wood retains memories in a way that metal and plastic cannot. It shows signs of use. It changes color and texture, wears and ages, even changes shape. I can look at one of my wooden spoons and see a dent from harried Thanksgiving cooking, or a dark spot from summer blueberry pie. 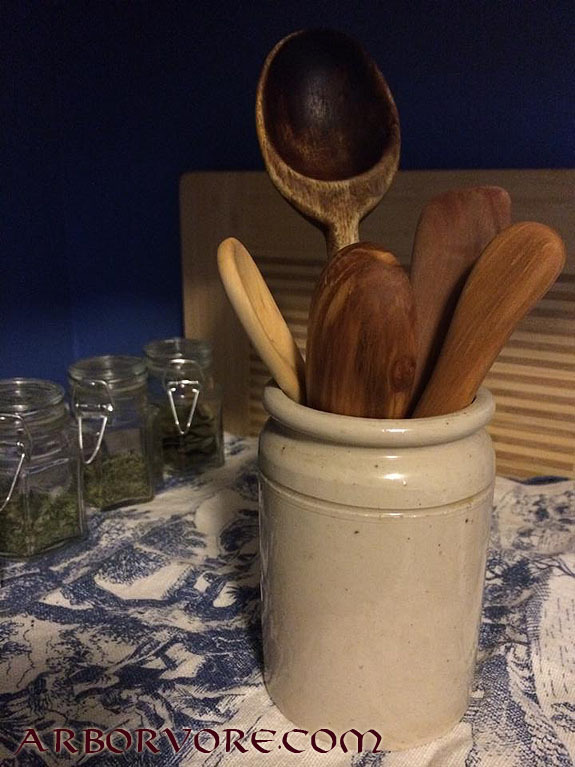 And when I use the wooden spoon that belonged first to my grandmother, then to my mother, and now to me, I cannot help but feel that I am cooking in the company of all past meals that the spoon has stirred and with the help of all the hands that have done the stirring. The photograph above shows a little crock of wooden utensils I keep close to the stove. In the back is my all-time favorite wooden spoon, and the only purchased one in the lot. It is worn, dented, burned and battered, but it is still my favorite cooking tool. I doubt anyone would develop this kind of attachment to a silicone spatula or a plastic spoon, and I’m certain that if I had purchased one of those for my first apartment that it would be long gone by now.